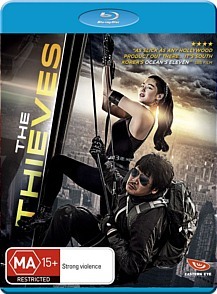 Thieves Blu-ray Review Once more the rest of the world is leading the way in regards to cinema: Hollywood hasn’t produced a heist film this engaging (or as fun) in a decade. Korea’s answer to Ocean’s 11 (and none too subtle about where it drew its inspiration from), The Thieves is a heist movie par excellence that manages to feel fresh, lively and engaging in spite of its well-trodden subject matter. Five thieves at the top of their game - a tough guy, a safe cracker, a cat burglar, a strategist and master of disguise - have been called together to join forces with a rival Chinese outfit to steal the biggest, most expensive diamond in Macau. The only catch? The diamond is located in a safe beneath one of the world’s most famous casinos. And the Chinese and Koreans can’t stand each other. Oh, and did I mention that every single person involved has their own shady agenda? The stage is thus set for the old school shenanigans, double-crossing and all-around chicanery that the heist genre is built on. And it works rather well. Despite veering dangerously close to becoming walking film archetypes, the characters here are mostly successful and interact well on screen thanks to some classy performances from the likes of Lee Jung-jae (The Housemaid) and the lovely Jun Ji-hun, who rose to prominence with a brilliant turn in 2001’s My Sassy Girl, at one point the highest-grossing film in Korean history, and is particularly funny here as the film’s trashy, leggy, materialistic cat burglar. The Thieves has done very well for director Choi Dong-hun, who is no stranger to heist flicks - his first film The Big Swindle was a tale of a bank robbery gone wrong that won dozens of awards throughout Asia, and follow up The High Rollers was set in the world of high-stakes gambling and mined similar thematic territory to its predecessor. Once more the rest of the world is leading the way in regards to cinema: Hollywood hasn’t produced a heist film this engaging (or as fun) in a decade.